HELIOCENTRIS established in 1995, Heliocentris Energy Systems has become a world leader in providing fuel cell and hydrogen technology systems for education, outreach and demonstration. An excellent demonstration of hydrogen technology. The model car with reversible fuel cell and graduated gas storage cylinders is simple to set up, fun to use and very robust. Great for individuals or small groups. A Middle School Introduction to Hydrogen Technology. Contains 8 experiments for grades 5 !V 10 students using the kit. All experiments are correlated to the National, California and Texas Science Standards. 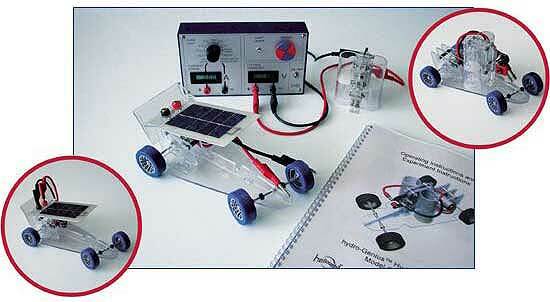 Teach science with 21st Century technology. 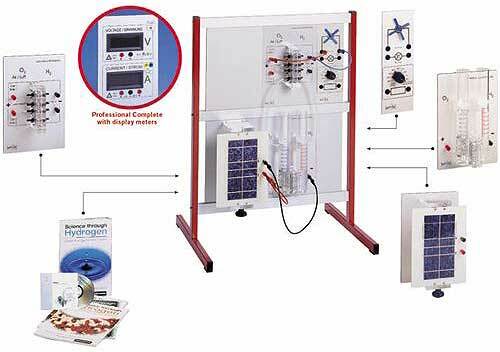 Based on PEM fuel cell technology, our Science Kits are designed to teach principles of chemistry and physics through solar-hydrogen technology. Great for individuals or small groups. - PEM electrolyzer: No added chemicalsrequired for operation. - Load box: Contains 7-position variable resistance, lamp and motor. - Resource-pack lesson books (In 4 volumes). 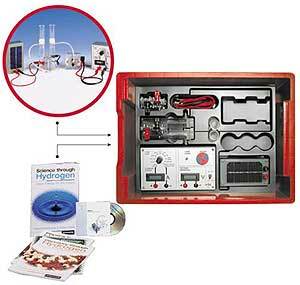 The Professional Science Kit teaches fundamental principles of chemistry and physics through solar-hydrogen technology. Large, vertically mounted components and easy to read displays are ideal for large group or classroom presentations. - Solar Module: The solar module can be tilted to vary the incident angle of the light source. - chemicals for operation, only distilled water (a solid electrolyte is contained within the electrolyzer membrane). - Fuel cells: 2 PEM fuel cells, can be connected either in series or parallel. - Load Box: Contains 10-position variable resistance, lamp and motor.